Fill in your details and one of us will get back to you straight away! Plumbing problems don’t wait for the sun to rise before they occur. These are issues that absolutely do not discriminate. You can be in bed and the next thing you know, you are on the phone with a plumber because there is water going everywhere. If this ever happens to you or you are here looking to see if we are the 24 hour service that you are looking for, go ahead and make the call because we will be there immediately and take care of the problem. Our Minneapolis & St. Paul plumbers will secure the problem in order to protect your home as much as possible, as well as repair the issue as quickly as we can. Same day repair is one of our specialties, so your emergency can turn into a full repair rather quickly, allowing you to move on with your day with the plumbing issue behind you. 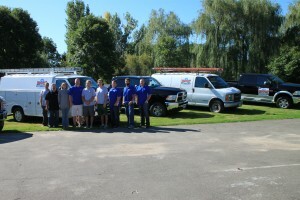 Many individuals throughout the Twin Cities have called us when they have had a plumbing emergency. It doesn’t matter if it is 2 a.m., we will show up as soon as possible so that you do not have to deal with the stress of a plumbing problem longer than you have to. It can be a night, weekend, or even a holiday and we will be there. We service both residential and commercial plumbing. Just as a homeowner may need emergency assistance, commercial establishments do too. Perhaps drains are backing up and need to be unclogged immediately before causing a flood in an area that should not be exposed to water. Then again, standing water in certain areas can create a hazard for employees. Regardless of what type of customer we are servicing, we will dispatch a technician to your home or business so that they can be there as soon as possible with the right tools. Each and every one of our Minneapolis & St. Paul plumbers have the knowledge and the experience to secure the problem, diagnose it quickly, and fix it on the spot. Most plumbing issues can be fixed right then and there because we have the tools and parts on-hand for the different types of plumbing that can be found in homes and businesses throughout the Twin Cities. When something goes wrong with your plumbing late at night, it is not going to wait until in the morning. If you have water everywhere, you need to have the problem addressed immediately. At Midwest Plumbing and Service, we are there when an emergency happens so that you don’t have to worry. We secure the situation, look at what has caused it, and we can make the repair right there on the spot in most cases. If you have an emergency or would like to learn more about our services, call us today at 612-807-8968 to request a free estimate. © 2019 and Service, LLC. All Rights Reserved.